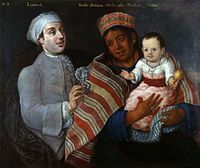 A casta pentin o a Spainyie man an a Peruvian indigenous woman wi Mestizo bairn, 1770. Predominantly Christianity (Roman Catholic, Protestant especially Pentecostal an Evangelical), Atheists. Mestizo (Peninsular Spaingie: [mesˈtiθo], Laitin American Spaingie: [mesˈtiso]) is a term tradeetionally uised in Spain an Spaingie Americae tae mean a person o combined European an Amerindian strynd, or someane wha would hae been deemed a Castizo (ane European parent an ane Mestizo parent) regairdless if the person wis born in Laitin Americae or elsewhaur. This page wis last eeditit on 16 Apryle 2016, at 18:04.